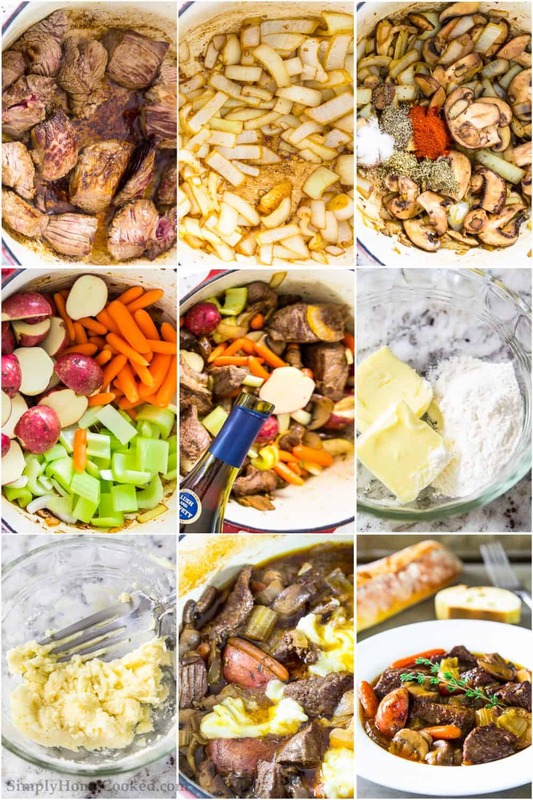 This braised beef stew recipe is so simple and so melt in your mouth delicious! It’s truly the ultimate comfort food! Be sure to try our braised beef short ribs and juicy braised beef recipe. Most folks turn to lighter foods this time of year, but I’m still on winter cooking mode. 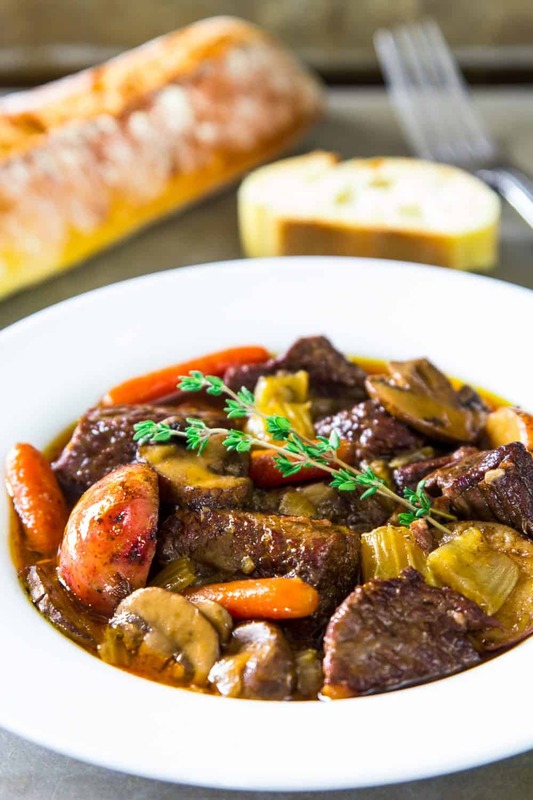 It’s freezing outside and nothing sounds better comfort food like braised beef, beef brisket sandwich, or this warm flavorful stew. So comfort food it is! If you prefer to make this braised beef stew recipe in a slow cooker, don’t skip on browning the beef. This step is crucial for improving flavor and locking in juices. This post may contain affiliate links. Read my disclosure policy here. This recipe was originally posted on Jan 31, 2018, we’ve tweaked it a bit since then. First, you’ll want to braise or brown the beef chunks in a large dutch oven pot over high heat. Then remove the braised beef chunks and reserve for later. Now, in the same pot, cook the chopped onion, minced garlic, and sliced mushrooms. Then you’ll add the spices (thyme, oregano, paprika, salt, and pepper) and simmer them for about 2 minutes. Next, add the celery, baby potatoes, and braised beef chunks, back into the pot along with the red wine and chicken stock. Now place the lid on and bring it to a boil, then cook the braised beef stew in the oven for 1 hour at 320 degrees Fahrenheit. How to thicken beef stew? 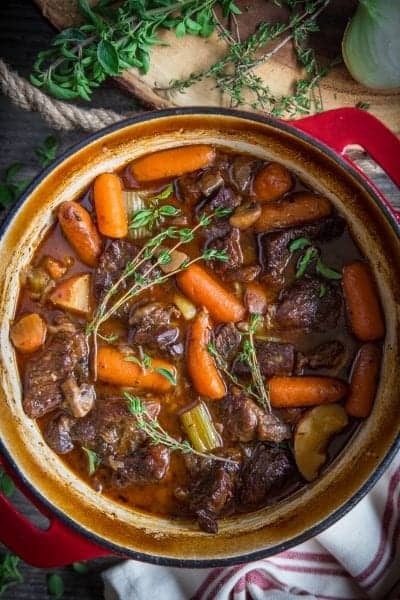 After the beef has been braised and cooked in the oven for about 1 hour, you can thicken up the juices by combing all-purpose flour and softened butter in a small bowl and pouring it straight into the braised beef stew. Then place the lid back on and cook for another hour. Brown the beef chunks in a skillet with hot oil over high heat, then toss all the remaining ingredients into a slow cooker (besides the flour and butter). Cook the slow cooker beef stew on low for 7 hours or high for 4 hours. Then mix the softened butter and flour and add it to the slow cooker beef stew. Cook for an additional 30 minutes on high. You most definitely can freeze beef stew! I love to freeze this braised beef stew recipe into gallon sized ziplock bags. Freeze for up to 3 months and thaw at room temperature. 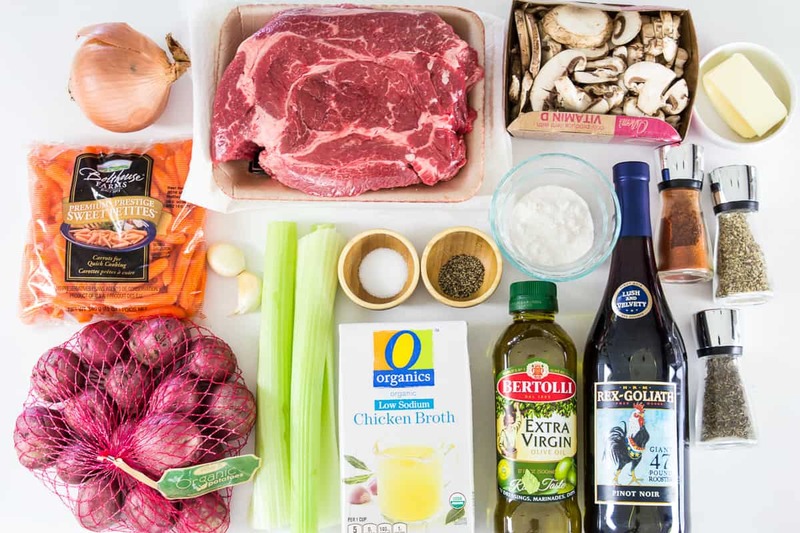 What to serve with beef stew? We love to serve this braised beef stew with mashed potatoes or even scalloped potatoes. Any bread like cornbread, harvest bread, or rustic bread is a great side too. Vegetable sides like garlic asparagus, cabbage cucumber salad, or shredded carrot salad. The simplest and most delicious melt in your mouth braised beef stew ever! Cut the beef into 2 inch chunks. Then add olive oil into a Dutch oven pot. Bring the heat to high. Once the oil is smoking, add the beef chunks into the pot. Evenly brown each side of the beef chunks. Then remove from the pot. Place the chopped onion and minced garlic into the pot and stir over medium high heat until the onion becomes translucent. Add the mushrooms and stir until they become tender. Then add 1/2 tsp thyme, 1/2 tsp oregano, 2 tsp paprika, 2 tsp salt , and 1/2 tsp black pepper. Stir and cook for about 2 minutes. Place the celery, baby carrots, and baby red potatoes into the pot, then place the browned beef chunks on top. Give them a quick stir. Pour in the red wine and chicken stock. Meanwhile, with a fork combined 2 tbsp softened butter with 2 tbsp flour. After the beef has cooked for 1 hour place the butter and flour mixture into the pot and cook for an additional hour with the lid back on.